A new photo showing the alleged killers of the Russian opposition politician Boris Nemtsov has surfaced in the Russian media. The suspects are shown sitting in a car in which they reportedly fled the murder scene. The photo, published by Russian tabloid newspaper Moskovsky Komsomolets (MK), shows two men, one of them allegedly the prime suspect Zaur Dadaev, sitting in a silver-colored ZAZ Chance. The car is one of the three police suspect the killers used on the day of Nemtsov’s murder, February 27. According to the tabloid, the photo was taken several days prior to the murder. The car is reported to have been bought in September 2014 from a woman in the Moscow Region. It was spotted near Nemtsov’s house in downtown Moscow a while later in the autumn, according to MK. 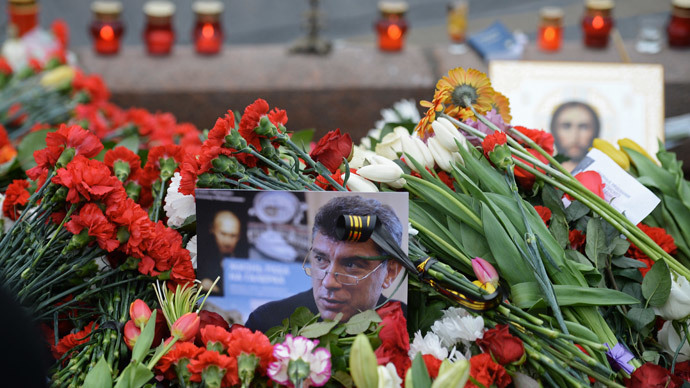 Nemtsov was reportedly being followed by the killers on the day of the shooting. According to police the killers changed between three cars during the day, LifeNews reported. Earlier Friday evening, Nemtsov gave an interview to Echo Moskvy radio and was followed from there to the murder scene. However, Dadaev said on Tuesday that he was not guilty and initially took the blame to save his mentee, MK reported. The other four suspects also denied being guilty. The Russian opposition has been skeptical of the Islamist motives behind Nemtsov’s murder. Nemtsov, a veteran opposition figure in Russia, was shot in the back four times while crossing the Bolshoy Moskvoretsky Bridge, near the Kremlin, and died at the scene. Several videos have emerged showing the traffic and pedestrian sidewalk at the moment of the murder. However the quality of the footage was only good enough to distinguish the cars on the bridge and the figures of people moving along it. Nemtsov occupied senior government posts under President Boris Yeltsin and afterwards joined the opposition. Since 2012, he had co-chaired the liberal party RPR-PARNAS (Republican Party of Russia – People's Freedom Party). The Russian opposition organized a march to commemorate Nemtsov after canceling a planned protest rally due to the murder on March 1. Thousands marched through the center of Moscow, crossing over the bridge near the Kremlin where the politician was shot dead. President Putin has promised that everything will be done to punish those responsible for the organization and execution of the murder.